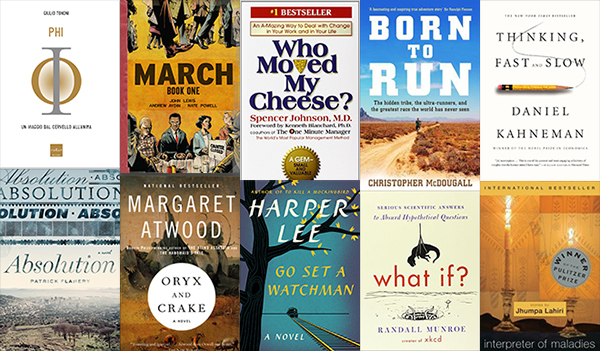 To help you idle away the summer, The Phi Beta Kappa Society compiled a list of selected reading. 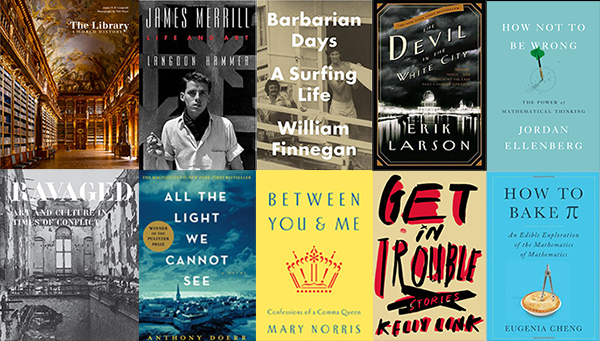 The 2015 Summer Reading List is a combination of new and classic books, suggested by Phi Beta Kappa national office staff, The American Scholar editors, and Phi Beta Kappa members worldwide who contributed on our Facebook page. This is by no means exhaustive, but rather a good start for a summer guided by the love of learning. Share a comment on our Facebook page and tell us how many of these titles you have read and which titles we should have included. A powerful memoir from NBC's news anchor and his battle with cancer. Stanford University psychologist explains how teaching a growth mindset creates motivation and productivity in the worlds of business, education, and sports. Columbia University professor maps out the superstring theory in physics in an approachable format. Hamlin offers a voice for evolutionary feminists of the late 19th to discuss their scientific findings in their own words. Watch Samuelson's lecture from the Rhodes College Phi Beta Kappa chapter event, "Communities in Conversation." A grounded and personal approach to philosophy and how it dictates life. A study of the everlasting sanctuary that is the library. A delicious course of easy-to-swallow math concepts explained through recipes. Stunning World War II era page-turner about the intersection of the lives of a blind French girl and German boy. Bringing to life the foundations of math and reason in an engaging way for everyday use. Acclaimed New Yorker writer dives into a lifelong obsession with surfing and its resulting adventures. Thrilling tale of two men--one an ambitious architect, and the other, a cunning serial killer--and the 1893 World's Fair in Chicago. The effects of war are often spoken about in terms of casualties of life, but here they are expanded to include casualties of culture. Rather than "science fiction," which creates new technologies in the future, Atwood describes her work as "speculative fiction" because the post-apocalyptic world she creates includes things in existence in the present. Set in post-apartheid South Africa, an author's journey to reconciliation through her biographer's search for truth. A guide to understanding how we react to change, told through the perspective of two mice and two "little people." Combining several decades of cognitive research, Kahneman explains the two modes of thought in terms of prospect theory, cognitive biases, and happiness. A collection of nine short stories by Indian American author Jhumpa Lahiri about the lives of Indians and Indian Americans who are caught between the culture they have inherited and the "New World." The earliest known work from the beloved author, Watchman follows up on the lives of the characters featured in To Kill A Mockingbird and the transformation of 1950s America. A first-hand account, in graphic novel form, of Congressman John Lewis's lifelong struggle for civil and human rights. McDougall follows the Tarahumara Indian tribe in the Mexican Copper Canyons and explores why the human species has developed an ability for endurance running. Entertaining explanation of scientific questions for the inner nerd. Neuroscientist Tononi explores the depths of consciousness through the eyes of Galileo.